Do you speak Irish? For language lovers, St. Patrick’s Day isn’t just about green beer, pub crawls, and parades – although we love that stuff, too. But why not raise a green glass to the language and culture behind the holiday with our St. Patrick’s Day To-Do List? A quick and easy guide to celebrating the Irish language right this year, consider this your four leaf clover. Looking for a traditional Irish meal to top off your day of indulgences? Bacon joints, or salted and smoked pork, make frequent appearances on Irish dinner tables, while special occasions often call for spiced beef. If you’re not feeling up for a home-cooked meal (it’s not easy being green), you’re in luck – Irish families often opt for eating out or preparing a frozen meal from the store. Top off your St. Patrick’s Day meal with good old fashioned Irish whiskey, the drink of choice in Ireland and on the American celebrated holiday. Derived from the Irish word for water, uisce, we strongly advise you not to treat this stiff drink as water on March 17th – even if you’ve got Irish roots. Good news for the indecisive: the Irish language doesn’t have words for “yes” or “no.” While you may be able to duck a few awkward questions – especially on St. Patrick’s Day – the verb form of your response will still express your answer and hold you accountable for your actions, for better or worse. So, instead of a simple yes or no response, you’ll repeat the verb with or without the negative particle and answer the question that way. May the luck of the Irish be on your side! Named after St. Patrick, the patron saint of Ireland, the holiday first appeared in Britain in the mid-1700s, when many Irish immigrants called it home. St. Patrick was a priest who, among other things, is said to have used a shamrock to teach the Christian trinity to the Irish. Lo and behold, the holiday’s loyalty to the shamrock persists today, along with a larger celebration of all the Irish culture and traditions that we know and love. Thanks for the holiday St. Patrick, you totally sham-rock. As contradictory as it may seem, English is the most widely spoken language in Ireland. While their style of English is highly influenced by Irish syntax, English remains the preferred language of many businesses, restaurants, and people in Ireland. Irish Gaelic is the original language of Ireland, and it remained the primary language throughout most of the country’s history, even spreading to nearby Scotland and giving rise to Scottish Galeic. Due to the influence of English power and the catastrophic Great Famine, Irish was eventually surpassed by English. Although Irish Gaelic remains an official language in Ireland, English is the vernacular of choice for most Irish people. So, keep your Irish close and your English closer – you’ll be ready to start a conversation whoever you come across on the Emerald Isle. Celebrating St. Patrick’s Day without speaking some Irish is like finding a three leaf clover – it’s just not the same. Learn phrases, culture, and conversation with our Irish course: it’s a fresh, practical, and flat out fun way to earn your own pot of gold this St. Patrick’s Day. Our custom course teaches you practical stuff you can put to use during your celebrations: introduce yourself, share fun facts, order drinks, and more. And you can keep the luck of the Irish with you wherever you go by accessing the course on the go with our fully mobile apps – even at the bar. 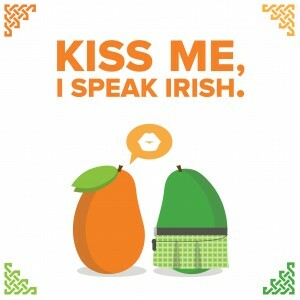 So break out your Sharpies and update your green gear: Kiss Me, I Speak Irish.